The College Advent term began on Monday 17th September. New families had moved here some time earlier so that their children could begin the new term in their new schools. For one couple, arrival at College happened on September 10th – just 48 hours after their wedding! This year we are fortunate to have students from the dioceses across the country – Norwich, Manchester, London, Sheffield, Manchester, Liverpool, Chester, Europe, Chichester, Chelmsford, Southwark, Blackburn, St Edmundsbury & Ipswich, Leeds and St Albans. We welcome 12 new students joining us for the first time and we welcome back 12 returning students. 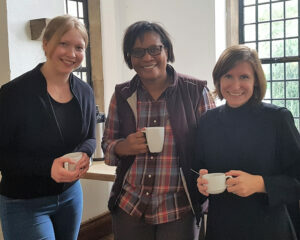 We’re also looking forward to welcoming Lois back in January once her exchange at Church Divinity School of the Pacific, Berkeley, California has been completed. We also welcome the Revd Dr Tony Carroll, who joins us as Dean of Pastoral Studies, and his wife Gisela. Tony has already made his mark impressing students and staff alike at the Lamb and Flag karaoke evening at the start of term! And finally, we welcome Miss Charlotte Chittick who joins the staff as Administrative Assistant and Communications Officer. You can follow her posts for the College on Facebook and Twitter.